Strength training for sport performance is something that will benefit every single athlete out there, irrespective of what sport they compete in or what strength training experience they currently have. Because strength is undoubtedly the mother of all qualities when it comes to athletic development. An athlete can never be too strong. This isn’t to be mistaken for saying an athlete can never be too big, because they can, there is a certain point of diminishing returns when it comes to size and athleticism. However, strength is highly neurologically based and it is entirely possible for athletes to continue getting stronger at their current weight without putting on additional size. This is accomplished through strength trainings ability to develop the nervous system. With more nervous system development you can recruit a greater amount of muscle fibers per contraction and therefore exert a greater amount of force in a given effort. The more strength an athlete has at a given weight, the better that athlete will perform. When you make all things equal between two athletes but one is stronger than the other, the stronger athlete will always win. So why is being strong so important for hockey performance? The list goes on forever. Hockey is a demanding sport which requires strength. The hockey players playing at a higher level are bigger and stronger guys for a reason, you need it if you’re hoping to be competitive out there. On top of the above, I have discussed in great detail within my past blogs on strength undeniable importance in the development of speed, power, agility, movement efficiency and resistance to injury. I highly recommend checking those out if you haven’t already. Power: The rate of force production (Force x velocity). Example: If two athletes 1RM deadlift is 400lbs but one athlete can get it done faster than the other athlete, they both have the same maximal strength but the athlete who repped it faster is more powerful. Relative Strength: The strength you have relative to your body weight. Example: Two athletes both have a 1RM deadlift of 400lbs but the first athlete is 20lbs lighter, the lighter athlete is more relatively strong. Being explosive, strictly from a physical sense, is truly the intersection between relative strength, maximal strength and power output. Relative strength and maximal strength are great to have, but if you’re not producing that force quickly you’re not going to be explosive. All three need to be there, just like a tripod, if one of these legs is knocked over the whole thing collapses. To make things super easy, let’s just say when they do this 1RM 400lbs squat it is equally distributed across their two legs, meaning, each leg is emitting 200lbs of force (to equal 400lbs) to get that squat weight up. Now imagine being out there on the ice in a standing position about to explode into skating, your take-off leg is going to press down on the ice emitting this 200lbs of maximal force down and backwards to explode your body into forward motion. This is where the importance of relative strength and maximal strength display themselves. Both athletes had the same maximal strength, so they will each press 200lbs of force into the ice to take off. But, athlete B is 20lbs lighter than athlete A so he will be more explosive with this take off as although they are both exerted the same amount of force; that force has a greater effect on his body due to his lighter body weight. In the end, he is able to explode further and faster than athlete A simply because he is more relatively strong. He has more control over his own bodyweight and is strong enough to propel himself further. Having said that, that would only be the scenario if power was equal between the two athletes as well. If athlete A was much more powerful, even though he is heavier and not any stronger he could still be more explosive simply due to his ability to create the 200lbs of force faster than athlete B. This can always go either way and this is always what separates athletes within their speed development. Relative strength vs. Maximal strength vs. Power. This is often why you will sometimes see an overweight guy move swiftly and quickly for short periods of time (before he gasses obviously), he may be overweight but his power development is there. The development of strength for explosive performance really comes down to neurological enhancement within the muscle. This is actually where most of the “newbie gains” come from when somebody starts training for the first time. They aren’t necessarily building muscle at some crazy alarming rate, they are subjecting their bodies to new movements and learning new skills and the body’s initial neurological adaptations to these movements is what allows them to gain strength at such a quick rate. What’s more than meets the eye here is that if you’re properly strength training for hockey, there is a ton of neurological carryover here between the gym and the ice. 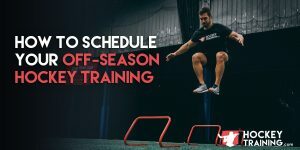 Meaning, improving your strength and power in certain movements isn’t just going to improve your “gym strength”, it’s going to improve your strength and speed on the ice. For more information on power training, check out my power blog post where I go into detail about the development of power and offer a workout as well within the post. But something I haven’t touched on much in the past is using bands and chains for the development of explosive strength and power. I want to first start out by saying although bands and chains are very effective tools, they are best kept for the intermediate and advanced lifters. Novices trainees (and even intermediate and advanced really) can go a really long ways with just their body weight, a barbell and some dumbbells. But if you’re ready to try something new and effective, bands and chains are a great option. Using these tools is becoming increasingly popular (mostly on social media to look cool) in strength training for athletes seeking power, maximal strength and relative strength. Using the standard barbell in training is predicated upon the resistance that can be lifted through the weakest portion of the lift, typically under-training your strong points (lockout is stronger in the bench press for most people as an example). Bands and chains get rid of this issue by increasing the amount of resistance provided as you reach the top portion of the lift where your strength is greater, also known as “accommodating resistance”. Bands and chains increase the amount of force provided at the top by either increasing weight (chains coming off the ground) or increasing downward elastic energy (bands). 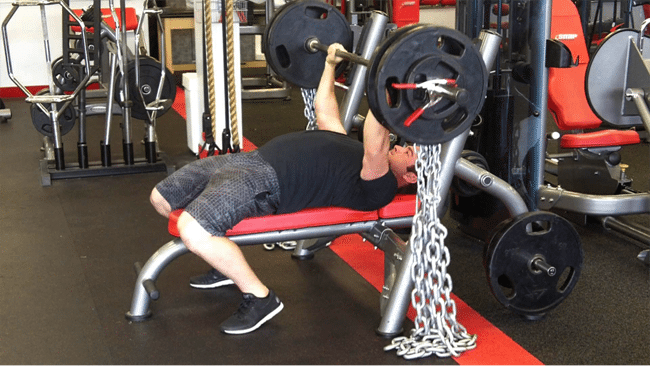 To paint a picture, if you have chains on the bar during a bench press, when you bring that bar down to your chest you will have also let a lot of the chains on the bar rest on the ground, therefore no longer providing additional resistance. 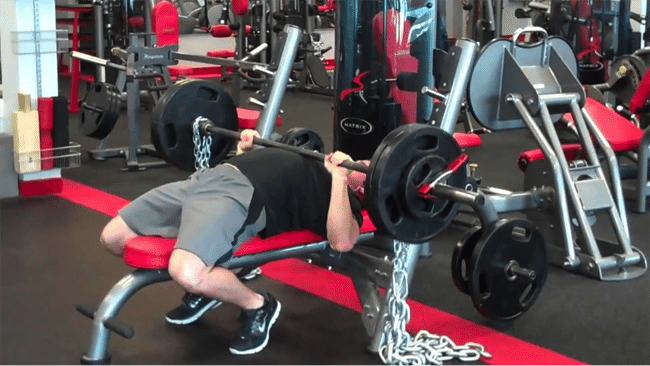 But, as you rep that bench press back upwards you are lifting both the weight on the barbell plus picking up the chains off the ground as well which gradually gets heavier and heavier. Once we hit the top, the total weight is both the barbell weight + weight of the chains, whereas at the bottom it is just your barbell weight. Although it can sometimes appear like the use of bands and chains looks like a fad, it’s really not. They provide a smart way to train and are a useful tool in any strength and conditioning coach’s tool kit. Additionally, using a barbell with additional band resistance has actually been shown in research to be more effective than traditional barbell training alone in improving strength and power in athletes. In a similar vein, other research has also shown that supplementing a portion of the total resistance during barbell training with bands or chains was extremely effective in enhancing power development since it allows for greater power production during the initial portion of the concentric contraction. Now does this mean that it replaces the traditional barbell + plates? Hell no, nothing can. But it can be intelligently incorporated into your periodization to enhance progress and explosive strength development. So what’s the difference between bands and chains? Chains actually have mass and can be accelerated like any other weight, whereas bands can only be accelerated to a certain point to where the resistance impart is equal to the force of the athlete. After this, effective acceleration really can’t exist. In a short answer, neither is better. They both provide accommodating resistance, they just do it a little differently. But to give you concrete advice in either case, studies show that for either bands or chains to meaningfully effect your progress they must apply a force equivalent to at least 10% of your 1RM during the lift. Also a tip just from experience working with athletes, it’s best to work with chains first before bands. Bands tend to be a little harder to work with and a little bit more advanced of a movement. These three lifts allow you to attack the entire musculature of the body while performing it in a safe way. Additionally, when power training you want to use as many muscle as possible within the lifts you are using as adaptations are muscle specific. So to develop total body power (and therefore explosive strength) it just makes the most sense to use the big lifts as you can apply the greatest amount of both specificity and overload to your training. In other words, don’t add chains to your concentration curl. Jackasses do things like that. When deciding how much resistance should be used by either the bands and chains it can get really messy pretty quick. The same band is going to provide more resistance to a taller guy at the top of the movement than a shorter guy. Chains can be defective in this sense as well, a taller or totally inflexible guy may not be able to let the chains sit on the ground at the bottom of a squat compared to a more mobile, shorter guy. What is supposed to be done in a perfect world you should stand on a force plate with an empty bar and determine with the digital read out how much force is being applied to your bar both at the top of the movement and at the bottom. From here, subtract the barbell mass and take the average. For example, the exact resistance is determined at the top and bottom of the movement. So if an athlete wanted to train at a 5RM with bands and his 5RM is 100kg, the average band resistance should be subtracted from his estimated 5RM weight. So if it was determined that the bands offered 22.5kg at lockout, the average would be 11.25kg between the figures. From here, the athlete should reduce his 5RM load 11.25kg as to not risk injury by adding too much resistance. But, most people in most gyms will not be able to do this and found the last paragraph confusing and useless so, the best thing you can do is to start light and work your way up in a safe and efficient manner over an entire training block. Remember, you’re NOT training for hypertrophy with bands and chains, leave that for the bodybuilders. Your main objective with these tools is power development so the weight should always be within the 50-60% 1RM range, you should always be moving with at least 90% velocity and never going to failure. Last but not least, the beauty with incorporating bands and chain work into your plan is you don’t have to do anything new and crazy to your program. Throw 5 sets of 3 power reps in at the beginning of your resistance or conditioning training sessions where you (should be) are doing your bench, deadlift and squat work anyways. From here, adjust accordingly! 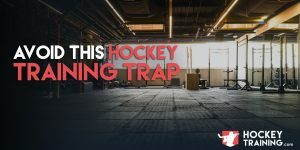 Do you want to become a better hockey player? 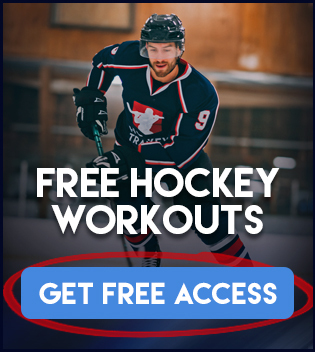 Get started with one of our Hockey Training Programs today!